“We can’t fix everything in the immigration system immediately. It takes time,” federal Immigration Minister Ahmed Hussen told a crowd of more than 150 at Century Gardens Recreation Centre. Hosted by local MPs, the town hall offered participants a chance to direct questions on a range of concerns, from family and spousal reunification, immigration processing times, to rights for undocumented workers and Canada’s role in aiding refugees and displaced peoples. More than 200 questions were submitted to organizers before the event. Hussen arrived late and managed to anger the crowd after abruptly leaving the discussion after roughly an hour with dozens of people still waiting to get answers directly from the minister. A small group of supporters also showed up to speak for the adoptive family of 12-year-old Widlene Alexis Earle, who is fighting to bring her to Canada from Dominican Republic. The group held #BringWidleneHome signs in the crowd and had hoped to ask Minister Hussen a question, but was unsuccessful. At more than 600,000 people, Brampton is one of Canada’s fastest growing cities and one of its most diverse. Brampton West MP Kamal Khera told the crowd that immigration is by far the biggest issue local federal representatives deal with. Local MPs hosted a similar town hall on immigration last year. Eliza Ataie, who moved to Canada from Iran several years ago, said she hasn’t seen her husband in three years. She attended Saturday’s session with her 20-year-old son hoping to plead their case on behalf of her spouse whose sponsorship application was refused. “Coming here took a boy away from his family in one the most important stages of his life. Despite of all happened to us, my son at 20 years old, is in last year of his program at University of Guelph, carrying out a research project at University of Manitoba over the summer. 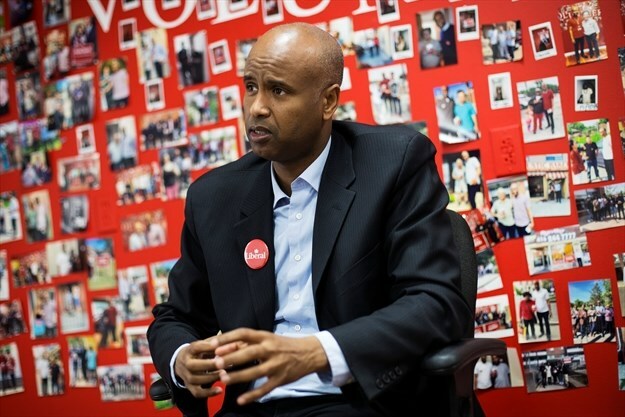 Hussen, who tried to tackle a range of issues in a short time, said the federal government is steadily making improvements to Canada’s immigration system “after years of neglect” under the previous government. Hussen listed changes made under the Liberal government since winning power 2015, including shortening the time it takes to process Canadian citizenship from 24 months to 12 months. On family reunification, the minister said the government managed to clear a backlog in the system by 20,000 cases as well as reduce processing times in the majority of spousal reunification cases to 12 months. “That’s progress. That’s a fact,” said Hussen, who acknowledged that while there have been improvements made to the system, including shortening immigration processing times, significant challenges do remain. Maryam Zargarzadeh, who moved to Canada in 2008 to pursue postgraduate studies at the University of Alberta, and who now works for a large energy company, drove more than three hours from Sarnia to voice her concerns with Canada’s spousal program. Zargarzadeh said she has been working nearly two years to bring her husband to Canada from Iran. In a process that should take a fraction of the time, Zargarzadeh said gaining a security clearance from Ottawa has been arduous for her husband, who is a professional engineer. Zargarzadeh said the couple is anxious to start a family in Canada. Zargarzadeh got an opportunity to speak directly to Hussen.